Not many people know the allure of Holiday Inn! :) I watch it every season - at Easter and every Christmas! I am so lame that I own it on both DVD and videotape! Yes, this is one of my favorite Fred Astaire movies...I adore the songs and the clothes! Lord help the mister, that comes between me and my sister (bat huge fake flower here), Lord help the sister, that comes between me and my man! 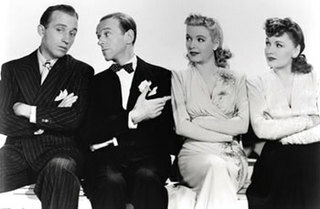 Holiday Inn is one of the classics I watch each year and we enjoyed it again this week. A late happy Christmas to you! My laptop was repaired late last night and I'm up and running again--thank goodness. Hey! He's not even a cripple!